Inside Storey: Some Serious Squash! 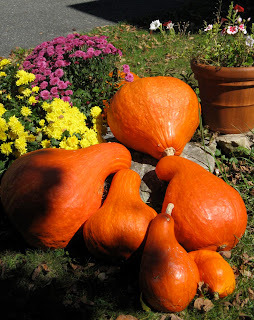 I have written two previous posts about my adventures with Boston Marrow squash — how I acquired my first squash and saved the seeds, my distribution of the seeds, growing the squash, and the successes and failures of family and friends who attempted to grow these particular winter squash in their gardens (see Big Orange Squash Growing in My Basement and Boston Marrow Squash Update). In the latter post I mentioned how my aunt Kristy had the most success with hers. So much success, actually, that she gave me four of her squash! and the second to smallest is the squash I grew. Here is the tale of my Sunday adventure with Aunt Kristy's ridiculously HUGE squash. "I got four Hefty one-qt. bags, and I don't think I used the whole squash. 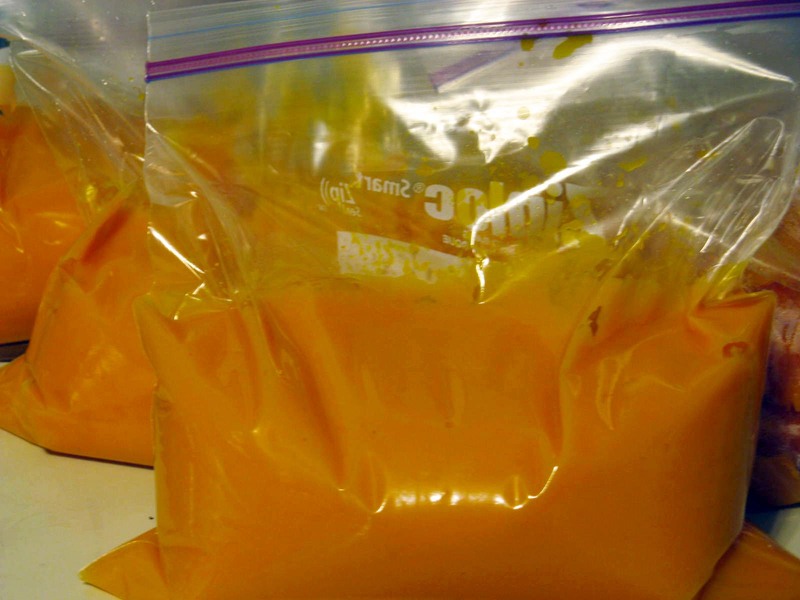 I put two good-size cups of pureed squash in each. Of the four squashes I have left, one is bigger than the one I cooked, two are a little smaller, and one is just about the same." She then offered her remaining four squash to me. I originally thought she was crazy to pass up these beauties, until I found out for myself how much time and work is involved in turning the squash into puree. I started by dropping the squash onto the driveway to crack it open, then rinsed it and scraped the insides into a bowl. Next I picked up Pumpkin, a cookbook with hundreds of recipes involving pumpkin (or other winter squash as a substitute) by DeeDee Stovel, to read up on different methods for cooking pumpkin. Now these are Boston Marrow squash, not pumpkins, but the methods of cooking apply to all winter squash. I followed the roasting method. In order to roast, one needs a large roasting pan — I pulled out the rarely used turkey roasting pan from the very highest cabinet. Next I preheated the oven to 400ºF (200°C), put the big chunks of squash into the pan, and drizzled them in olive oil; then I picked up the individual hunks and rubbed the olive oil evenly over the pieces, put them back in the pan skin side up, and popped the pan in the oven for 45 minutes. Aunt Kristy's squash. All the pieces are rubbed in oil and ready to go into the oven. 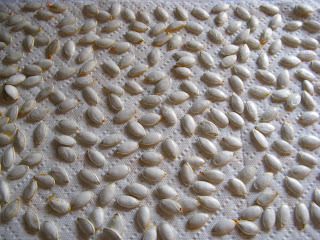 While the squash was roasting, I laboriously picked the seeds from the innards, washed and rubbed the remaining slime off, and set them out to dry. This was definitely my least favorite part of processing the squash. But I want to grow more next year, and these squash are very hard to come by. So saving the seeds was important for me to do. 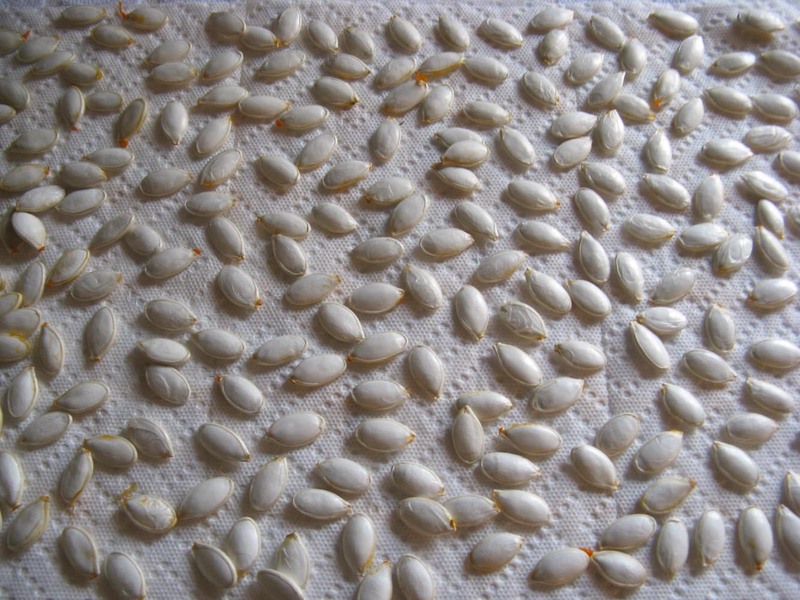 Cleaned seeds, set out to dry. I plan to grow more Boston Marrow squash next year. The squash is done roasting when you can pierce the skin and flesh easily with a fork. The 45 minutes was enough time, so I took the pan out and let the pieces cool off for a bit. Once they were cool enough to handle, with a knife I cut away the skins and cut the pieces of squash into smaller chunks and placed them into a soup pot. I set aside all the skins and innards in a separate bowl for the compost bin. The cubed squash filled the soup pot three-quarters of the way. I mashed it all with an old-fashioned potato masher, then pureed it with an immersion blender. No other ingredients were required. I wanted my puree to be neutral in flavor. That way, when it comes time to use it up, I can go savory or sweet. If you are certain what you plan to use it for, you can add your seasonings before freezing. 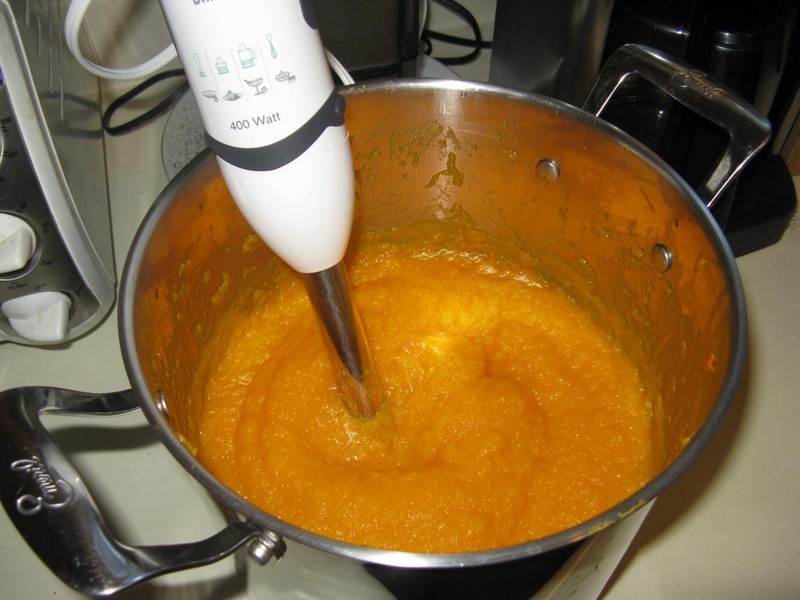 Pureeing the squash with an immersion blender. The whole process took 2 hours for one squash! I must be a sucker for punishment, because I repeated the process with an even bigger squash, in addition to my stepmom Leanne's little one. This filled the turkey roasting pan plus a regular-size roasting pan. With a few interruptions, I finished about 3 1/2 hours after I started the second squash — crazy, I know! 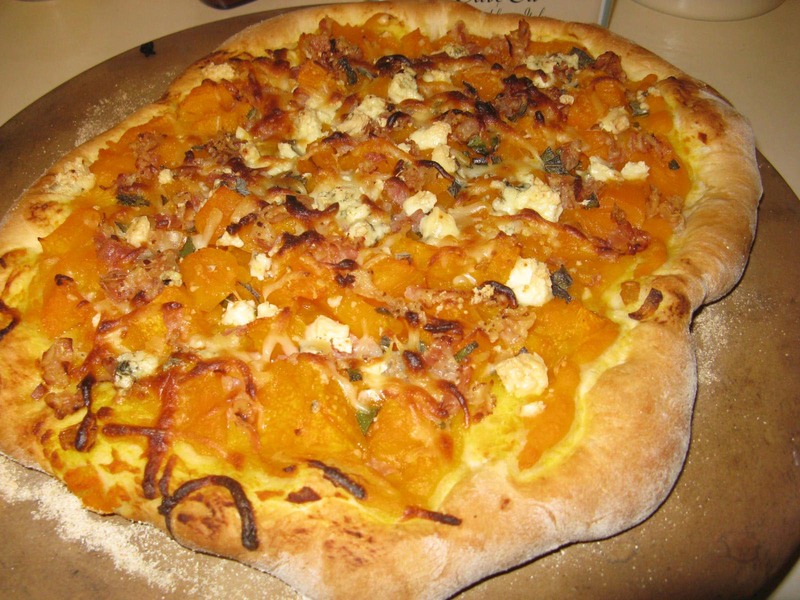 plus some extra for a "pumpkin" Gorgonzola pizza. I pureed almost all the squash. 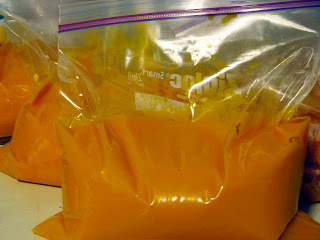 I put about 2 quarts of puree into each gallon freezer bag, five bags total. Once they had cooled, I sealed the bags and put them into the freezer. 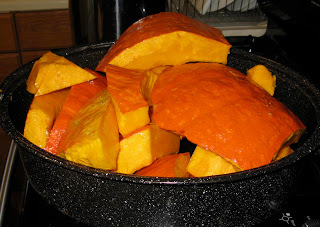 I did, however, freeze some as chunks, too — many recipes call for using pumpkin and winter squash that way. I also kept a few of the chunks out for dinner. 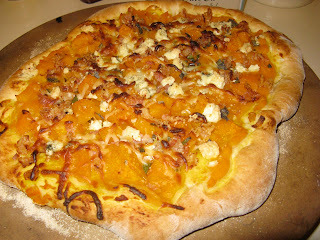 I diced them up and used them in a "pumpkin" Gorgonzola pizza (recipe from Pumpkin). diced, fresh sage; and crumbled Gorgonzola — Yum! The processing of the squash was a whole-day event, but my labors will be worth it when I have delicious squash to use in desserts, savory tarts, risottos, casseroles, and stews throughout the winter months. I am curious if anyone has had experiences with Boston Marrow squash. It seems to be quite rare. I read in a blog months ago when I wrote the first post on these, that Boston Marrow squash makes a better pumpkin pie than pumpkin. And last night my chef husband said he liked the taste of the Boston Marrow much better than that of butternut squash. Let me know if you have grown or cooked with this particular winter squash. Thanks for posting your detailed cooking instructions. I had tried slow-roasting, steam-roasting, and high-temp. roasting (skin side down). None were satisfactory, and oh so time-consuming. I sure am glad you wanted those four behemoths, because I knew I didn't want to repeat that process again this year. Yes, I agree with you on that. I still have two of your squash and one of mine left. And, I too, don't want to repeat the process this year. I decided to use them as fall decorations instead. As a matter of fact, my mother-in-law stopped by and asked where I bought them. She was quite impressed that you grew them! I'll be sure to return to this post later this month when I'm wanting to impress family! I just recently made a jackolantern, only its spilling succulents out of its mouth to great and disgusting effect. I posted a couple photos on my blog if you want to see it. Such a fantastic idea. If I had the freezer space, I would certainly do this. For now, I will keep it in mind. Thank you for sharing.